Stay Safe With 4 Propane Tank Tips! With summer fast approaching, we can practically smells the burgers and hot dogs! In fact, every Tuesday at our main location we fire up the grill and provide a free lunch for all our loyal clients. It is a great way for us to show how much our clients mean to us while eating delicious food. But what is the key to out-of-this-world BBQ? The key behind making a good juicy burger or perfect cooked hot dog is a full tank of propane. 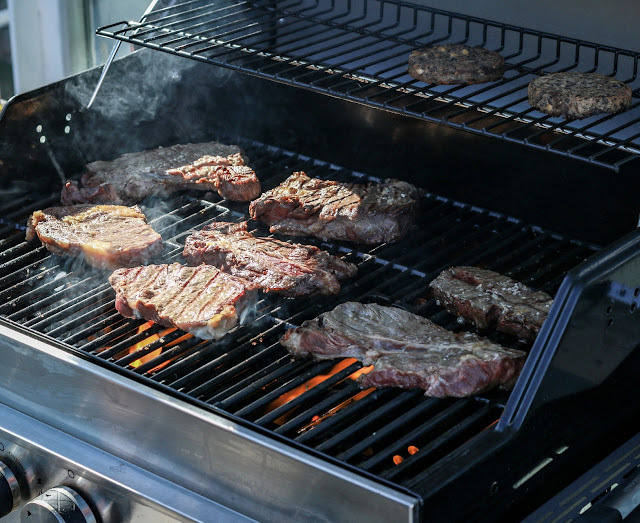 If you have a gas grill in your backyard, you have had to fill up your share of propane tanks just around dinner time. Before you rush off to the nearest store or Matthey Service Station, remember some of these important safety tips! Always turn off the tank when it is not in use. If you even detect a foul odor coming from the tank that is a sign to turn it off immediately and avoid lighting any match near it. Propane is extremely flammable, so keep all your grill tools far away from it to ensure you stay safe. Every time you use a new propane tank make sure you check for leaks immediately (Even if it comes for us!). You do this by using a simple solution of soap or detergent mixed in water. Dip a washcloth in the solution and wipe the rubber tubing with the washcloth. If you see bubbles forming on the rubber tubing, then your rubber tubing is leaking. Never attempt to patch a leaking rubber tube. Instead, purchase a replacement. Always store your propane tank outdoors. It is so important to never store your propane tanks in enclosed spaces, such as your garage or basement. Along with being in an open space, always keep propane in an upright position and away from any source of heat and direct sunlight. Always transport a propane tank in the standing position! When coming home from our service station, secure the tank securely with a rope. Never use a metal chain to secure the propane tank because metal hitting metal can produce a spark which could be disastrous if there is a leak! Whether you are firing up the grill or using it in an engine, always be safe when using propane! If you need to refill your tank or have more detailed questions, stop by Matthey Service Station and don’t forget to head over to our main location for a delicious BBQ lunch every Tuesday this summer at noon! It is spring and while the temperatures rise and flowers are in bloom, pollen is out in full force. 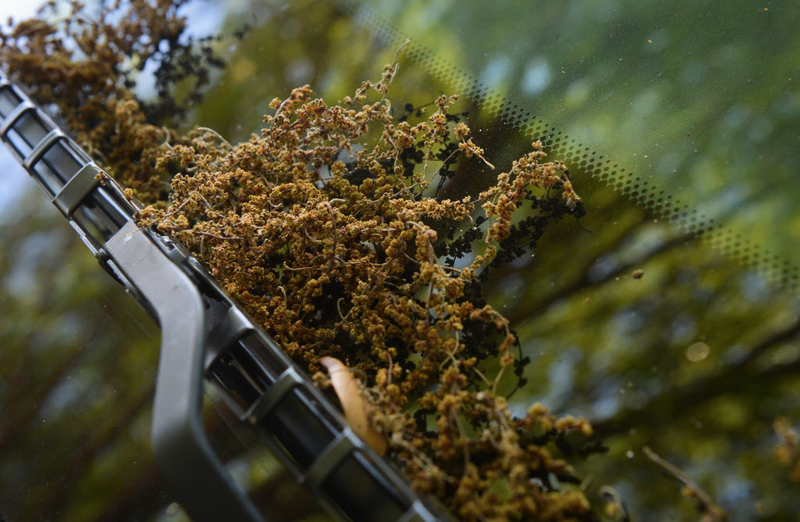 Pollen effects more than allergies, it can create a mess for your car. While it is not harmful in small quantities, it can effect your allergies and car appearance if left for too long. Before it builds up too much, try to stay ahead of the yellow dust with these helpful cleaning tips. Check your air filter. If you are an allergy sufferer, this is an important step. Make sure it is free of any dirt and if you are unsure, it is a good idea to replace it. If you live near a high concentration of trees, top off your wiper fluid to ensure you can always spray it clean while on the road. Along with wiper fluid, keep your wiper blades clean so you dont just spread around the dust. Visit the car wash! It doesn't matter what color vehicle you have, a build up of pollen will show. To stay ahead, clean your car every couple of weeks during the spring months. Keep things clean from the inside out throughout the season. Enjoy the weather and make sure your vehicle does too! How Bad Is Road Salt For Your Car? Every winter season our sidewalks and roads get covered in snow and ice and to prevent potential accidents salt crews lay out road salt to counteract the winter weather. The salt chemically lowers water’s freezing point causing the ice to melt which allows for the tires of your car to reach the road in order to gain traction. While road salt allows for safer traveling despite the winter weather, it also has some drawbacks. The major negative to road salt is its effect on the exterior of your vehicle. Road salt can cause rust and corrosion on your vehicle, specifically the undercarriage. The bottom of your vehicle is completely exposed which puts your exhaust system, muffler, coil springs, subframe, and hydraulic brake system at risk for damages. Rust on essential parts of your vehicle can be very dangerous. Road salt, though very helpful during the winter months, can cause major body and undercarriage damage to your vehicle unless you take certain precautions to avoid these damages. 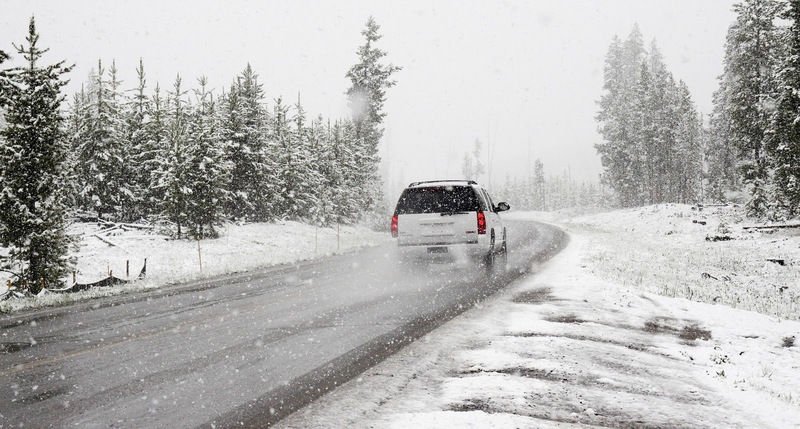 Yes, these damages can be alarming, but there are a few ways to prevent road salt damage. • Avoid puddles and plow trucks: Puddles hold larger amounts of salt and driving right before a plow truck means your vehicle will be the first to drive through the freshly laid salt. • Wash your vehicle after a snow storm: Remove the salt off your car as soon as possible. • Be aware: Have your vehicle inspected by your local mechanic after the winter season to make sure everything is still functioning properly. As driving on road salt is pretty common in our area during the winter months, drivers should be aware of the potential damages it can have on their vehicle. If a red brake warning light goes on, it’s important to bring your car in immediately. This is a sign of low fluids and can result in severe damages to the vehicle. Keep in mind that a lot of these damages are not noticeable or obvious, so it’s important to stay up-to-date on your vehicle maintenance schedule. 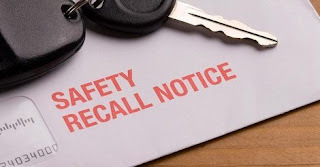 As a car owner, you have most likely received a recall or safety notice regarding your vehicle at some point. It is often had to tell if these are important or not. While automakers sometimes issue recalls or send safety notices for things as minor as an incorrect label, they often alert you to a major issues like a faulty airbag system. Recalls notices are not to be ignored! It’s very important to heed these warnings, which will keep you and everyone on the road safe. No matter what that recall notice is regarding, it’s important to address the matter quickly. If you have a question regarding your specific vehicle, internet sites such as www.recalls.gov/nhtsa will provide you with the necessary information. Then, if you find that there is an issue with your vehicle, bring it into your Mechanic right away! *Terms and Conditions: Appointments must be scheduled Online between 01/11/17 and 01/31/17. Service must be performed no later then 02/07/17. Matthey Automotive will choose the brand Oil and Oil filter to be used, no special requests. Oil change intervals vary by manufacturer. Matthey Automotive recommends you follow the oil and filter change frequencies outlined in your owner's manual. Why Is Colored Smoke Coming From My Exhaust? Just as you experience certain symptoms when you are sick, your car also has ways of telling you when something is wrong. 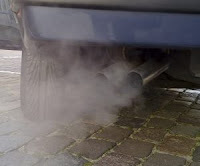 One of the giveaways to a clear problem with your vehicle is noticing colored smoke coming from the tailpipe. As a responsible driver, it is important to pay attention to your vehicle’s operation and notice if anything seems off. Believe it or not, problems regarding your engine can be partly diagnosed by looking at the exhaust coming from your tailpipe. So before you go into panic mode, you can get an idea of what’s going on according to the color of the exhaust smoke. Black smoke is in indication that your air-fuel mixture is running high, which means there is too much fuel and not enough air. This color smoke can indicate a problem with the fuel injectors, fuel pressure regulator, or something as simple as a clogged fuel line or air filter. A small puff of black smoke during hard acceleration is nothing to be concerned with, but under normal driving conditions and idling the exhaust should be clear. Essentially, if black smoke is visible regularly the engine is burning too much fuel. Blue smoke means the engine is burning oil, which can be a result of leaking valve seals or worn out piston rings. Oil is being leaked into the combustion chamber and burned along with fuel. Oil has no place in the combustion chamber, which requires air, fuel and spark only. Aside from problems like poor mileage, acceleration, starting and rough idle, burning oil means you’re losing it. Constant loss of oil means your vital engine components are not being properly lubricated which can lead to a whole host of additional problems. Gray smoke is more difficult to diagnose, because it can mean that the car is burning oil or it can mean that there is an issue with the automatic transmission fluid getting burned up in the engine. In latter case, the problem is a faulty transmission vacuum modulator causing transmission fluid to get sucked into the engine and burned up. Gray smoke could also mean a stuck PCV (Positive Crankcase Ventilation) valve. When the PCV valve gets stuck, pressure can build and lead to oil leaks. PCV valves are relatively inexpensive and can be fixed usually while you’re waiting. Thin, vapor-like white smoke is normal and not cause for concern. But, thick White smoke is definitely something to be concerned about. This color smoke may indicate that coolant has made its way into the combustion chamber, and this only occurs if you’ve got a bigger problem that should be addressed immediately. If it is not taken care of quickly you risk overheating and major engine damage. If you notice the color of your exhaust has changed, the best response is to have your car seen by a mechanic immediately to diagnose the problem. If you delay service or ignore the problem, you run the risk of a complete breakdown of your vehicle and increased repair costs. Although the color of the smoke may give you an idea of what’s going on under the hood, it is important to have a professional mechanic properly diagnose the problem. Matthey Automotive’s highly trained mechanics, using state-of-the-art diagnostic equipment, will get to the heart of the problem quickly. With our professional and experienced mechanics on the case, you’ll know you and your vehicle are in good hands. As we inch closer towards the end of the year, the days are growing shorter and the weather is growing colder. 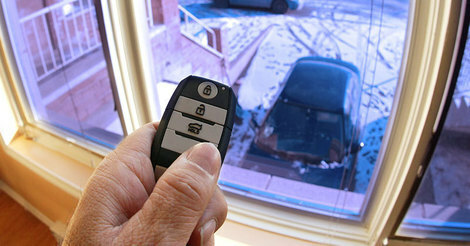 Getting into a freezing car first thing in the morning is an unpleasant experience, so most of us choose to start our engines and let them idle till they warm up. Contrary to popular belief, this is not good for your engine. Letting your car idle actually decreases your engines life by stripping oil away from the engine’s cylinders and pistons. The life of a vehicles piston rings and cylinder liners can be significantly reduced by gasoline washing away the lubricating oil. "The Environmental Protection Agency lines up with those who say warming up your car is not only not helpful but is wasteful." Even though you may have to throw on a scarf and gloves before leaving in the morning, driving your car is the fastest way to warm up the engine. Yes, you’re going to be cold during the first few minutes it takes for the radiator to warm up and start blowing warm air. But, you'll be saving yourself fuel, time, and money! All it takes is a drive to the local Whole Foods supermarket and other environmentally conscious stores, to find new, designated parking spots/ electric stations for hybrid & electric cars. Even many gas stations are now adding alternative fueling areas. This increase in popularity has furthered the debate about the future of alternative fuel vehicles. The big debate about alternative fuel cars has been around for many years. With so many types, it can be hard to decipher which type of vehicle is right to buy and if it is worth it. Whether it is electric, biodiesel, methanol and gasoline blends, ethanol or hydrogen, the technology for each of these types of alternative fuels has improved exponentially in the past decade. One of the most popular options for alternative fuel cars is the hybrid. 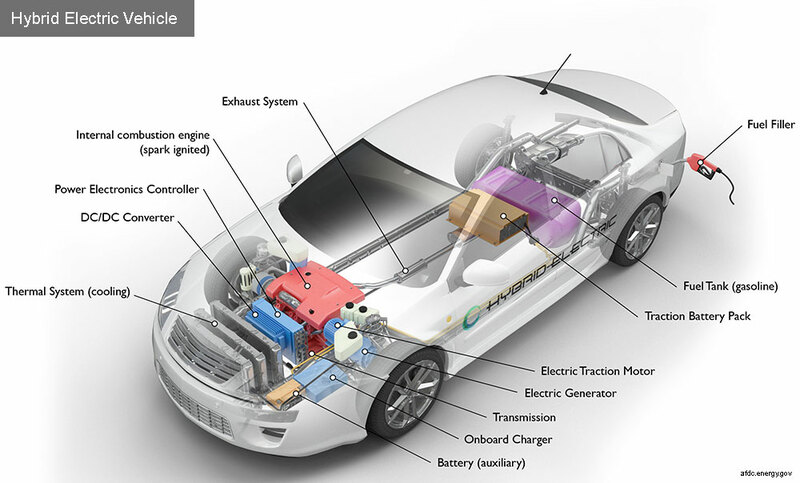 Hybrid vehicles use two sources, one electric and one gas, to power the car. While they can save their owners money and contribute to helping the environment, hybrid vehicles are NOT maintenance free. Rather, they present their own set of maintenance issues because they provide areas for needed maintenance from both gas and electric motors. Not every traditional auto repair shop has experience and knowledge in repairing such vehicles, leaving customers stuck with going to the dealer for repairs. 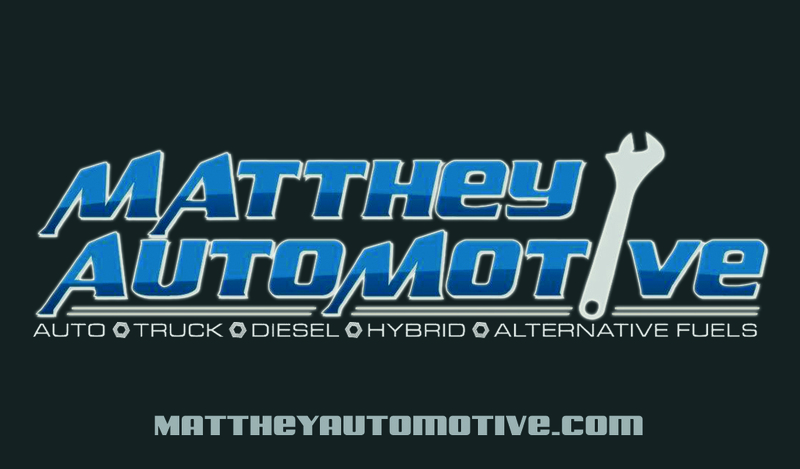 At Matthey Automotive, we are dedicated to alternative fuels and repairing alternative fuel vehicles. We provide customers with a knowledgeable staff helping with all maintenance needs. 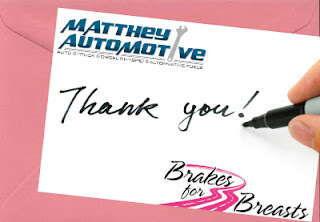 Thank you to everyone who participated in this year's Brakes for Breasts Program! We couldn't have done it without the support of our loyal customers! We can't wait to present our donation to The Cleveland Clinic and help advance this wonderful research. The secret to vehicle longevity is not a secret. If you want your car to run better, longer, and more trouble free, regular maintenance is key. We have compiled a short list of some of the most important car care tips to keep your vehicle in tip-top shape for many years to come. 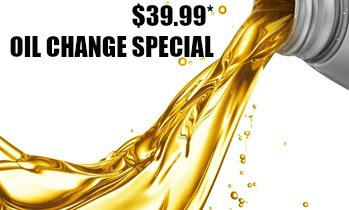 Change your oil regularly based on your manufacturer’s recommended schedule. Oil is the life-blood of your engine. Nothing can shorten engine life faster than neglecting oil changes. Keep your car clean! Don’t neglect to rinse the underside of your vehicle and apply UV protectants to plastics in the interior. Also, it is recommended to give your car a fresh coat of wax once before winter and once again in the spring. Have the cooling system flushed once per year to prevent corrosion and buildup of deposits in the cooling system. Change the transmission and differential fluids when required. Refer to your owner’s manual and the follow then recommended service schedule. Your car is a machine full of moving parts. Everything needs to stay properly lubricated to prevent early wear. Have your brake system bled and the fluid replaced once a year. This helps prevent corrosion which can avoid costly brake repairs. Keep tires properly inflated to prevent uneven tire wear and potential tire failure. Tire pressure changes in cold and warm weather so it is important to check it frequently. These are just a few of the steps you can take to keep your car running trouble free longer. For more maintenance and care information, check your owner’s manual. Your manufacturer designed and built your vehicle so your owner’s manual is the best resource to learn how to properly care for your car. Brake warning light on? Screeching, grinding, squealing, or other strange noises when stopping? These are serious indicators that it's time for your brakes to be inspected. Make an appointment between 10/01/16 and 10/31/16 and receive FREE brake pads or shoes, just pay for labor and any other ancillary parts needed. AND, Matthey Automotive will donate 10% of the proceeds from the brake jobs to the research for the Cleveland Clinic Breast Cancer Vaccine Fund. 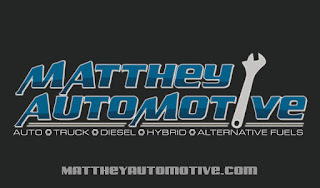 Call Matthey Automotive today for more information and to make your appointment! 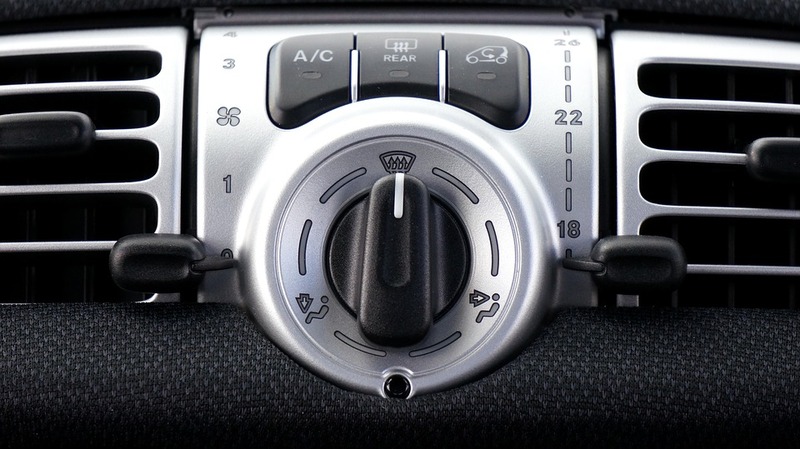 If the summer heat drives you to distraction, the last thing you need is a malfunctioning air conditioning (A/C) system when you’re on the road. Checking your vehicle’s A/C annually will help you keep your cool when temperatures soar, says the Car Care Council. A service technician checks pressures to test operation, refrigerant charge and outlet temperatures.